The Road Where I Was Born October 1944,Earliest Memory Approx 1944 - a Memory of Barking. Opposite the Odeon cinema, the spotted dog and off licence. I'm certain it was Tommy Keene from Axe St who would be on Wakering Rd with his barrow selling sea food by the half and pint on Sunday. The co-op chemist, then the Insurance shop with a ship in a glass case in the window, Fletchers the butchers, Larkins sweet & tobacconist shop, Savilles seed, spice merchant, Lings artist suppliers, Sucklings greengrocer and a Ladies dress shop. 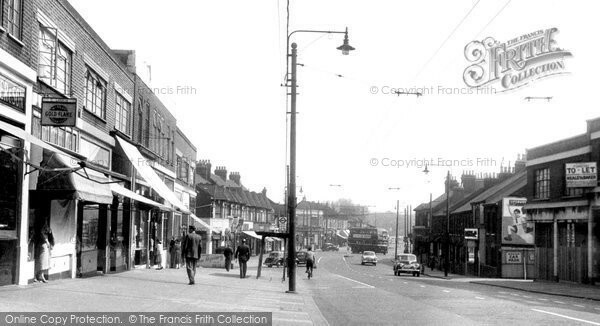 Then 37 Longbridge Rd, Frank Hawken shoe maker and repairer,(my father), you can just make out the cream painted corrugated sign with name on. Next door but one was Boyles the dentist. The trolley buses stopped outside the ladies dress shop and Hawken's shoe shop and the conductor would have to use a long pole to re-place the electric arms on a trolleybus to overhead wires if they came off, before the trolleybus could continue on its route. There was hardly any road traffic then, pedestrians aplenty. Children safely played marbles in the gutters & lost them down the drains! Eating out, literally, was eating the best fish & chips from Pesci Bros on the way home, dining out was supper at the Odeon. The bakers was Fances on Fanshawe Ave, gents outfitters was Dunns, Princes for ladies apparel, embroidery silks etc & when you paid for your purchases the monies were placed in a shuttle & sent overhead to the cashier in her central kiosk, who would return the change & receipt. A memory shared by Lesley Hawken on Jun 12th, 2013. Send Lesley Hawken a message. hi, do you remember the name of the chinese restaurant on the corner of cecil ave barking in 1960. thank you. Hi Lesley,re Tommy Keene,he was one of my uncles.You are quite right,i checked it out with my cousin Maralyn,one of his daughters.He also had a stall outside The Brewery Tap.My Aunt Tilly used to do most of the work on that stall.They moved from Axe street to Gascoigne Road and had a shop there.It was nice to see your memories. Hello Lesley, thanks for your memories. I remember Bill Saville. He was a friend of my old man. Also Mr Boyle the dentist had an assistant who made the dentures. His name was Mr Payne. You couldn't make it up could you.